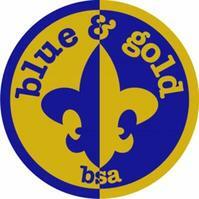 The Blue and Gold Banquet is a cub scout tradition. We will dine together, enjoy some entertainment, and celebrate our scouts achievements this year. Our Webelos scouts will receive their arrow of light award and bridge to boy scouts in a grand ceremony. Bring your cameras and the whole family! There will be a carnival provided by each Den, Magician and custom made balloons. Come prepared for some awesome entertainment! The Pack will provide cupcakes. Uniform of the day is Class A. Please sign up below to help us plan.